If you have a broken garage door, Taylor Door Co. is the best company for garage door repair in Sterling Heights, Michigan. We offer top-notch garage door repair services including hinges, cables, springs, rollers and gear kit repair. Our highly trained staff can help you with all of your needs for your garage door repair in Sterling Heights, Michigan no matter what the obstacles are. 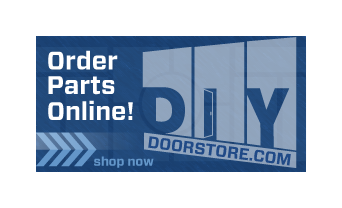 We supply only the best manufacturers’ products, including our own Michigan-made Taylor doors. We stand behind our repair service with the same quality and dedication that we back our products and parts. Not only are we experienced in garage repair services, we also know how to work fast and get the job done right the first time. For a free estimate regarding garage door repair in Sterling Heights, Michigan, call us today at (586) 755 – 6500. If you want to know how to get garage door repair in Sterling Heights, Michigan, Taylor Door Co. is the company for you. Don’t get scammed or overcharged by untrustworthy companies. We are the affordable and reputable garage door repair company in Sterling Heights, Michigan. A member of the International Door Association, Taylor Door Co. has been servicing garage repairs and garage door openers in Michigan for more than 30 years. We are the experienced company for garage door repairs in Sterling Heights, MI. If you need repairs or services, all you have to do is contact Taylor Door Co. We offer free estimates, and we can answer your questions about garage door repair in Sterling Heights, Michigan. Our Sterling Heights, Michigan garage door repair company is dedicated to affordable and quality services, which is why you should choose Taylor Door Co. for your garage door repair needs. If your garage door requires repair or your garage opener stops working, our professionals can help you fix it! We will make sure that you never pay more than $300 on garage door repair in Sterling Heights. We even offer free estimates for our products and repair services. Taylor Door Co. will fix hinges, cables, springs, rollers and more! For more information about garage door repair in Sterling Heights, contact us today at (586) 755 – 6500. Get Garage Door Repair in Sterling Heights, Michigan Today! Taylor Door Co. is the best company for garage door repair and garage door openers in Sterling Heights, Michigan. We offer affordable prices for our services, parts and products. Our professionals will make it easy for you to get garage door repair in Michigan, because we get the job done right the first time. When you hire Taylor Door Co., you can expect friendly service and quality products without any hidden fees. For more information about our services and prices, you can reach us at (586) 755 – 6500. 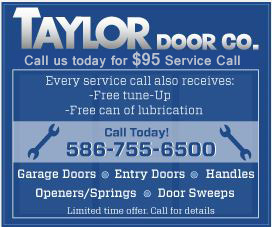 Call Taylor Door Co. today!